This is the salad that got away from me. I mean that in a good way. It started out as a riff on Heidi Swanson’s Mostly Not Potato Salad. I love potato salad. Any potato salad. I know some people have strong feelings about mayo, as in they hate it, but I am an equal opportunity potato salad lover. If I’m going to make a more traditional one myself, I feature mustard strongly and mix the mayo with Greek yogurt so there is more tang and bite than glop. But whatever you want to make for me, I will eat. Having said that, I liked the idea of a potato salad in which the potatoes were just a part of the ensemble and not the star. I also like the idea of some things cooked and some things raw and so off I went to make it one Sunday night. And then, two dinner guests came over and so I started adding things to it. Having just gotten some terrific whole grain tips during my trip to the Thermador kitchen, I added some black quinoa to the mix. (Two tips to share, add while grains in unexpected places, like potato salad, and cook up a big pot of your favorite grain, store it in the refrigerator, and use it all week.) To bulk up my salad to feed four, I also added a bit of farmers’ market lettuce and a perfectly ripe avocado. I had a favorite dressing already in my refrigerator and dinner was served. I liked this so much I made it again the next night. You can use regular quinoa instead of the black called for here, but it won’t look as striking. Tossing the warm vegetables with a bit of the salad dressing first will allow them to absorb more of the dressing. Place the shallot, mustard, vinegar, a large pinch of kosher salt, and a few grinds of pepper in a wide mouth jar. Cover and give a vigorous shake. Uncover and add the olive oil and cover and shake again. Adjust the dressing to your taste with more oil, salt or pepper. Place the potatoes in a small pot and cover them with cold water. Salt the water and bring to a rapid boil, then lower the heat to a gentle boil. Cook until a knife can be inserted easily into the center of each potato, about 15 minutes. Drain and set aside. Place a medium sauté pan over medium heat. Add just enough olive oil to coat the bottom of the pan and then add in the leeks. Cook, stirring occasionally, until the leeks soften but do not allow them to brown, about 5 minutes. Add the asparagus and sauté for another minute. Scrape the vegetables into a large salad bowl. Cut the potatoes into bite-size pieces and add to the bowl. Toss the warm vegetables with just a bit of the dressing, then layer on the cucumber, herbs, tofu, lettuce, quinoa, and avocado. Drizzle on more dressing and toss carefully. I love the sound of this potato salad and I love the idea of adding whole grains to random places! 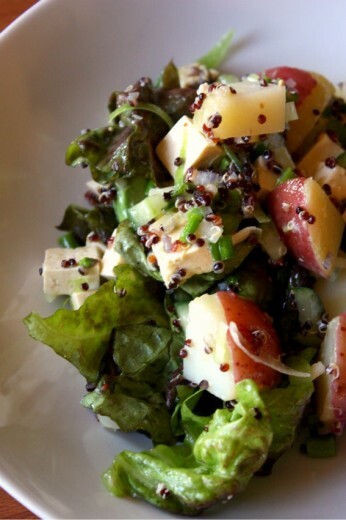 In my opinion, the nutty flavor of quinoa or the crunch of wheatberries is always welcome. Yum – potato salad and this version looks delicious. I usually make my potato salad with a mix of dijon mustard, sour cream and mayonaise with lots of dill and pepper. 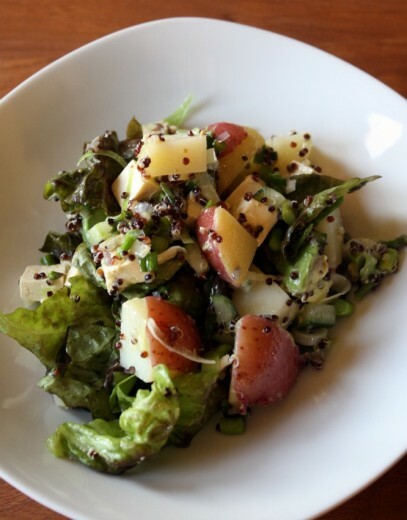 Love this idea of adding quinoa to potato salad! Would never have thought of that, thanks for sharing. Yes, yum! My kind of potato salad! Oh wow! You just made my stomach growl, and I’m not even kidding. This looks amazing. Great job… again. ps. Heidi Swanson is so wonderful – thank you for recommending her to me! This looks amazing! I have had quinoa, but never black. I am going to try and find it. Looks and sounds delicious. Thanks for a great post! I wish I had the ingredients to make this now. Hunger + lack of groceries in the house is not a good time to be reading food blogs! This salad has it all. Great summer meal! I am also a fan of “lighter” potato salads and this one looks delicious. I am making it tomorrow night!